The Kathy Kallick band is based on the west coast, from the San Francisco Bay Area to Anchorage, and their powerful mixture of original and classic music has great appeal everywhere. Their latest release, “Horrible World,” has been out for a few months and is getting played throughout the world(s) of bluegrass/folk/acoustic music radio. The album contains a half-dozen new Kathy compositions, an original instrumental from KKB member Tom Bekeny, distinctive covers of numbers learned from Bill Monroe, the Carter Family, and Bob Wills, plus a couple of unique interpretations of traditional songs. Kathy’s exceptional career includes winning a Grammy and two IBMA Awards and collaborating with the country’s top acoustic musicians – including her mighty current band: Annie Staninec (fiddle), Greg Booth (dobro, banjo), Tom Bekeny (mandolin), and Cary Black (acoustic bass), all of whom provide sterling harmony vocals. 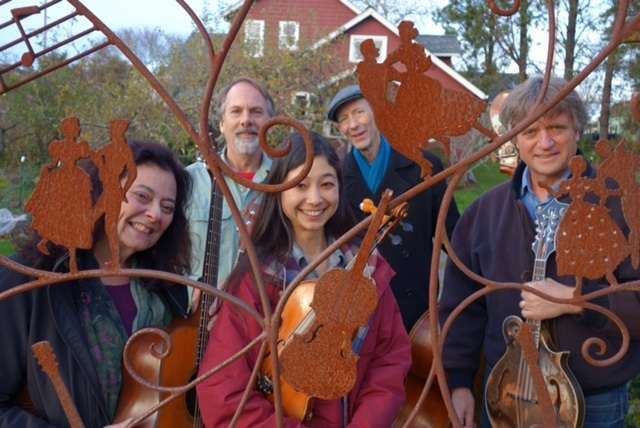 Led by one of the music’s extraordinary composers and vocalists, the Kathy Kallick Band is among the most dynamic and affecting groups in bluegrass, and have nearly as much fun as the audience when performing. The material is compelling, the songs have lots to say, the tone ranges from humorous to bittersweet to soulful, the instrumental playing is dazzling, the vocals luminous.